If you have Bad Credit and need an Auto Loan, visit Del Toro Auto Sales in Auburn. We are the best place for Bad Credit Auto Loans, and unlike other financial institutions, we will accept your loan regardless of your credit score. We understand people endure financial hardship, which is out of your control, and as a result, your credit score is affected. Del Toro Auto Sales helps people rebuild their credit while owning a vehicle of their dreams. Our Bad Credit Auto Loan provides you the opportunity to purchase a vehicle that is affordable and convenient. With our experienced and talented financial team you will get a loan and terms that you can afford, and one that you will be able to make your monthly payments without strain. Our auto loans will allow you to purchase vehicles that you were not previously able to afford. In addition to great loans, you do not need to put forward a large down payment because of the loan providers that we work with as well as the incentives that comes with purchasing a vehicle. Thanks to our competitive interest rates, your monthly payments will be affordable. Our auto loans have flexible terms that can be made into long period payments. This is beneficial because the longer the term for your payment, the smaller the monthly payment will be. Regardless of your financial situation, we have built loans that cater to all situations and easy to acquire a loan. You should visit Del Toro Auto Sales to apply for one of our auto loans. Another benefit of our Bad Credit Auto Loan is it provides you the opportunity to increase your credit score. All you need to do is pay your affordable monthly payment or any loan, consistently and on time,ff and you will see your credit status improve over time. After your auto loan is paid off, you will find it is easier to obtain loans from other financial institutions. 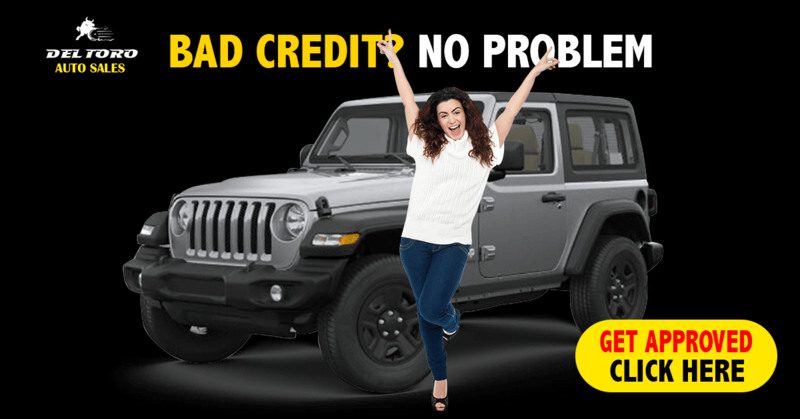 Call or visit Del Toro Auto Sales to inquire about our Bad Credit Auto Loans. Our knowledgeable team of professionals are standing by to help you. We look forward to the opportunity to serve you and help you purchase a car of your dreams. This service is very helpful as well as important,thanks for sharing this. If you are looking for Auto shop equipment,then you can contact segaequipment for more details.